The win improved the Terps season’s record 4-2 including a 2-1 Big ten record. While the loss all but guarantees a bowl less season for the Knights. Coming into today’s homecoming game, many wonders if Maryland will be able to cover at home as over 23 points favorites to win against visiting Rutgers. Early on, things didn’t start out well for the Terps. As they’ve done all season Maryland continues to suffer from self-inflicting penalties that keep killing drives. For the first 9 minutes of this game, Maryland looked disorientated on offense and simply failed to sustain drives. Eventually the Terps were able find their footing when they decided to turn to their strong running game. As they’ve done all season with a struggling offense that hasn’t find their passing rhythm, Matt Canada’s offense was forced once again to rely on their running game to move the ball. Maryland quarterbacks struggled once again completing even short easy throws. Due to those passing issues early on, Rutgers were able to stack the box with 8 to 9 men fronts. The Scarlet Knights had plenty of success with that game plan in the early going however that all changes once the Terps started using their speed to get the edge against a Rutgers defense that wore down evidently. Maryland came into the game ranking top 4 in the conference in rushing yards per game with over 236 however today they were able to pound the undersized Rutgers front to the tone of 290 yards on the ground. Rutgers had no answers for the slew of Terps running backs and eventually got worn down. To say senior Ty Johnson has loved his career facing Rutgers is an understatement. Coming into today’s action Ty has average over 120 yards against the Scarlet Knights for his career with a staggering 10.9 per carry. Well today the senior couldn’t be stopped. Johnson had his way with Rutgers all day and really gave the entire Maryland team the momentum it needed to break this game open with a few of his typical Ty Johnson home run carries. Johnson started today’s scoring late in the first quarter when he breaks loose for 65 yards run off the right side of the offensive line lead by fellow seniors Matt Moore and Damien Prince. Johnson finishes his day with 132 yards on just 9 carries to go with the 1 touchdown. Senior wide receiver Taivon Jacobs has had a very frustrating season so far but not for the lack of him getting open. Too many times during the season he’s beaten his man only for the pass to be way off target. Early on he had a few chances for easy receptions but once again Terps quarterbacks were off target. 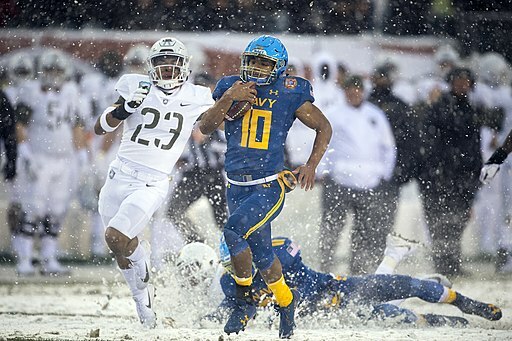 However late in the second quarter red shirt freshmen quarterback Kasim Hill was able to found Jacobs at the back of the end zone on a 3rd and long play for the easy 23 yards passing touchdown. On defense senior safety Darnell Savage Jr had somewhat of a makeup game after his struggles last weekend against Michigan. All Savage and the defense did today is picked up Rutgers to the tone of 5 times, the most by a Maryland team since 1998. Savage Jr now leads all Big Ten defenders in inceptions with 4 for the season including 2 today against Rutgers. Terps defenders flustered the Rutgers quarterbacks all day and gave the Scarlet Knights little breathing room until late when the subs were already in for the Maryland defense. Terps came into today’s game ranking dead last in the Big ten conference in passing offense and while many hopes the passing attack can gain some confident against a struggling defense thing still look bad for the most part today. The quarterbacks are still holding onto the ball for too long and today it resulted in Kasim Hill getting hit from the blindside and losing the ball on a fumble and a Rutgers recovery. Things like that just cannot continue to happen if Maryland looks to be some of the more quality opponents still left on their schedule. Maryland quarterbacks have struggled all season with accuracy issues and today we saw many instances where the Terps left chances for huge gains go for nothing with poor throws and or drops. A few times Maryland wide receivers and pass catchers got behind the entire Rutgers defense only for Kasim Hill or Tyrell Pigrome to be way off with the pass. Against the better opponents those things will be a huge killer for this team. The Terps quarterbacks ended their day with an awful 85 total passing yards on a Rutgers defense that came in with one of the worst pass defenses in the entire Country. Hill did however complete 3 passing touchdowns to bring his season totals to 6. 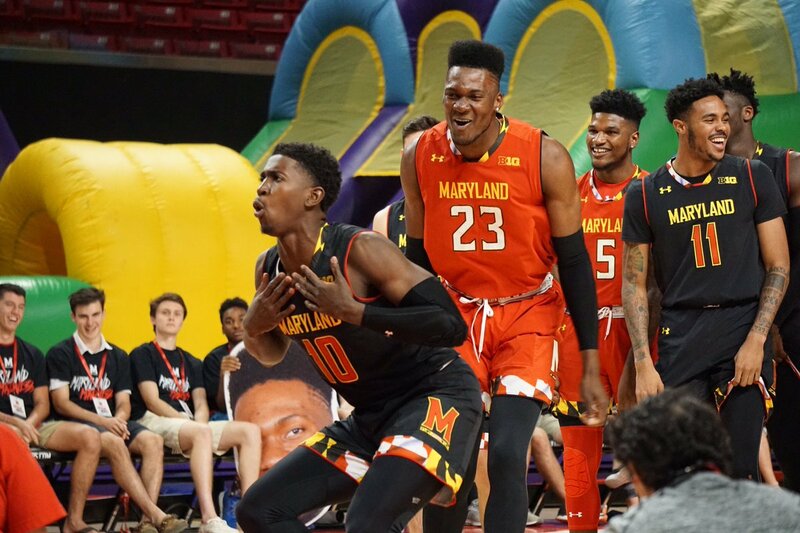 If the Terps wants to take the next step and go from a good offense to an ELITE one they’ll need both Kasim Hill and Tyrell Pigrome to carry their share of the load on their shoulders. No one is saying for them to go out there and throw for 300 yards they just simply MUST be able to complete the short to intermediate throws. This offense will be unstoppable once they figure out a way to get defenses to respect the passing attack. Hill stats today 7/17 for 76 yards passing and 3 passing touchdowns, which are a career high for the red shirt freshmen. True freshmen Jeshaun Jones had his coming out party against Texas in week 1 however opponents have been keying in on him ever since. Jones hasn’t really got into the game plan much since however the freshmen looked as elusive and electric as ever today against a Rutgers team that seemly had no one to cover him. With the Scarlet Knights running mostly one on ones on the outside against the Terps, Jones beaten his man repeatedly but Terps failed to find him until early second half when Kasim Hill found him on a fade route in the back on the end zone for his first score since that Texas game. Another Tampa Florida guy also made their presence felt in a major way. Byron Cowart once was considered the nation’s top recruits and while things didn’t work out for him up at Auburn things are surely looking up for him in a Maryland uniform. Over the last few weeks but really for the entire season Byron has been borderline dominant. Rutgers had no answers for him all game long and Cowart simply feasted. Cowart ended his day with 6 tackles, a sack, 1 tackle for loss and he also had a great interception for the first of his career. If Byron Cowart continues to play like this he’ll surely be a one and done in College Park as pro scouts are once again salivating about his pro prospects. Tre Watson another Tampa guy also had an interception in less than a half of playing time. Maryland came into today’s game with only 3 inceptions on their season yet came away with a stunning 5 interceptions today. The 5 ints are the most by any Maryland team since 1998. Maryland entire defense came to play today and even without a key starter to start the game, that Terps defense simply was unbreakable today. Maryland frustrated Rutgers offense in all phases and eventually caused Rutgers to change quarterbacks but even the backup came in and threw an interception to another Tampa guy senior transfer Tre Watson. Watson had missed the entire first half due to a very questionable illegal hit called against him last week. In only a half of playing time Watson showed once again why he’s so valuable to that defense going forward. His physicality at his linebacker spot is starting to trickle down to the entire defense. Cornerback Tino Ellis also came down with the very first interception of his career early in the third quarter. The Terps defense is beyond much improved from the one last season, this year’s defense is as fast as any in the conference and they are now starting to gain confidence from those performances. Going forward if this defense can continue to improve I can see them keeping the Terps in the rest of their games even if the offense struggles as it did early in this one. Antione Brooks is quickly becoming a budding star in the conference as he continues to wreck offense at the line of scrimmage. Terps defense ended their day allowing ONLY 180 yards of total offense for Rutgers nearly more than half of that coming after long the game has been decided. Rutgers was held to a pedestrian 8 yards of passing offense, one of the best showings of passing defense in Maryland history. This defense will only get better as the season moves forward as well.